On November 10, 2016, digital media producer and host of Swedenborg and Life Curtis Childs appeared on Find Your New Normal—a weekly broadcast that focuses on finding ways to live in the moment for those seeking peace after crisis. 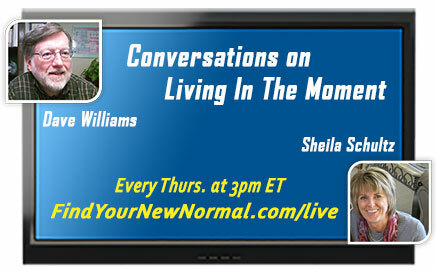 During the captivating hour-long interview, co-hosts Dave Williams and Sheila Schultz talked with Curtis about how Swedenborg’s writings about the afterlife can offer comfort, support, and guidance in the here and now. In one particularly interesting exchange, Sheila asks about Swedenborg’s take on reincarnation and Curtis provides an eye-opening explanation of Swedenborg’s theory of spiritual regeneration which has all three members of the conversation grinning and laughing by the end of his answer because of how deeply unique and enriching the content is. Watch the full video webcast on the Find Your New Normal website now! Tweet @swedenborgfound to let us and others know what you thought. Post the info to your Facebook wall and tag @HeavenandHellSwedenborg. Write a blog about the interview and share it on social media.